CNC Billet Aluminum Airbox Adapter with large K&N Performance air filter & water repellent Outerwears. Allows you to safely run with an open airbox (no airbox lid) for a Stage-2 high performance tune. Use with or without performance exhaust system. 15-20% Power Increase with Open Airbox and Performance Tune. This Billet Aluminum adapter bolts into your stock airbox with little modification and allows for a tight sealing performance air filter to replace your stock low performance and poor sealing air filter. 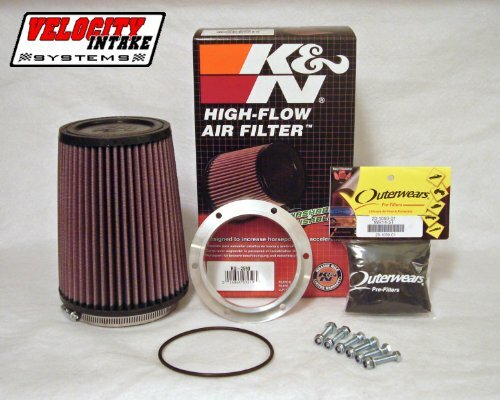 Includes K&N Performance air filter and matching black water repellant Outerwears Pre-Filter. Hardware and rubber seal included, Easy Installation!! Lose the stock air filter setup, it does not seal well and you're going to get an aftermarket filter anyway right? Requires modification to stock airbox, you'll need a 1/4 in. drill bit. Top Quality Airbox Adapter at the best price you'll find Anywhere!! !